He should ask for some mills. Trying to get the economy on its feet. He should get more loans like sharif from imf. pehli bat to patwarion ko zehan se nikalen gy to kuch acha soch sken gy na. noon league ne ap sb ko apne peche lga liya hai tbi kuch nae ho pa rha. govt ho minister hon IK khud ho ya supporters sb unko kosne ma lge hain. kuch kro bhayi. A reputed international journal Foreign Policy has issued the list of 2019 global thinkers. 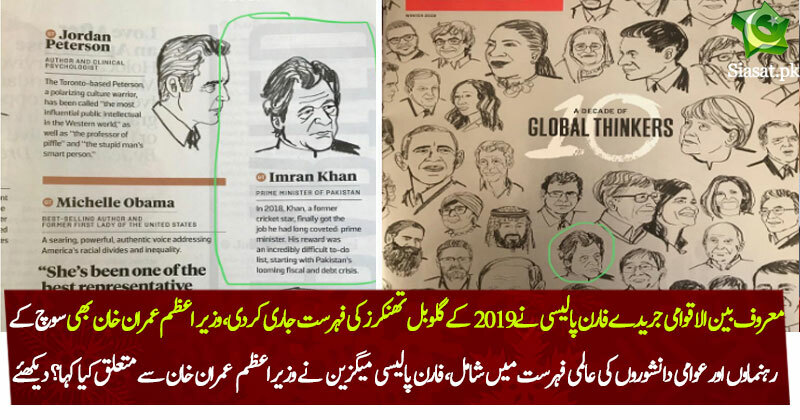 The global list of thinkers and public intellectuals also carries the name of Prime Minister Imran Khan. According to Foreign Policy magazine, former Cricketer turned Politician Imran Khan is facing difficult situation including fiscal and debt crisis ever since assuming the office of Prime Minister. One would not see names like Nawaz Sharif and Zardari in thinkers list, I wonder why. Mulk tabah krnai walon ko kossaaa hi jaata hai, dua nahin di jaati! Aur fikar nahin karain, PML N, MQM, PPP, MMA, ANP, sab laaqi e Nafrat hain! har koi nawaz shareef nahi hota ke apni beti de ke lng deal krle. bhayo ap sb se aik guzarish hai. nawaz sharif se bahir niklo aur kam kro. uska nam le le ke kuch kr b nae rhe ap log ya govt. Yeah..i remember the good old days of Nawaz and Zardari when Pakistan used to give out loans to others. IK is doing the same. whats the difference? Way better than being 'parchi master', 'ghaseetu' or money launderer.